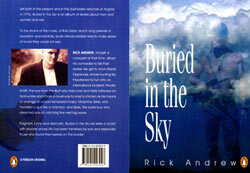 Rick Andrew - Artist, Design Arts Lecturer, hidden years Musician & now Author. His book deals with conscripts, the supposedly non-existent border war & rock & roll in Angola & South Africa; judging from the reaction the recent Radio interviews & since appearing on Carte Blanche - Buried in the Sky seems to have struck a chord with the many thousands of young-men who survived - or who believe they may have survived - the SADF of the late 60's & 70's.) (p)© Penguin Books 2001 / Rick Andrew - The book is now available at most book stores, in paper-back, country-wide. Or call Penguin Books in Johannesburg (011) 616-8248 or post your queries on the Page: Song Trading. At Ondangwa the regiment was required to take on, and sign for its full quota of weapons, ammunition and transport. This involved some waiting, so we found an ablution block and had showers with warm water for the first time in three weeks. It was a good feeling to be sitting about, clean, and without any pressing duties. Of course this was an ideal time to pick the guitar, and it wasn't too long before our group was joined by another soldier carrying a guitar. 'Howzit,' he said, and squatted down. Men moved aside to make space for him in our circle. His name was Gary. Then began the usual ritual of musicians in deference to one another. Since I had already been playing for a while, I invited him to contribute a song. 'No, you carry on. I'll just jam along with you,' he said. I was relieved to see that, like me, he had given a fair portion of his life to the guitar. He had a good sense of rhythm, played with a sensitive hand, and knew all the necessary chords. 'Let's see your guit,' I said. A solemn exchange of guitars followed. We both fiddled about, showing off various flourishes and licks. The new guy and I were pretty much on a par when it came to technique. He played some bits with a Flamenco flavour, while I tended to be more bluesy in approach, using twangy bass notes to make the rhythm hop. His guitar had steel strings and a hand-painted ban-the-bomb sign on the headstock. 'Nice action. What sort of stuff do you play?' I asked, handing back the guitar. He started to play Leonard Cohen's Suzanne. And you want to travel with her you want to travel blind. He then launched into a Sonny and Brownie number, working it into a beat that got everybody moving together. I watched the new guy, Gary He looked a bit of a skate. His brown sun hat included a display of crude ballpoint pen draw-ings, a yin-yang symbol, and the strangely incomplete no fortune bro . . . His head bobbed forward on his neck as he sought to engage you with his eyes. He'd smile a knowing smile, enhanced by the cigarette dangling from his lower lip. He was sturdily built with strong arms and a big stomach. His dog tags swung from his neck, and tapped on the guitar every now and again as he hunched over it. I called out a Dylan song and he knew it, Knocking on Heaven's Door Easy to play and to jam to, an easy round. G, to D, to A minor, followed by G, to D, to C. Most of the men knew the song so we had harmonies and impromptu drumming on thighs and on water bottles. As guitarists we could have fun taking occasional lead breaks, since there was always one of us to carry the rhythm. Consider how our situation increased the poetic resonance of Dylan's lyrics. Well, things got under way The group grew and we played and sang all the usual requests: Donovan's Catch the Wind, Dylan's All Along the Watch Tower, Love Minus Zero, and Mr. Tambourine Man. Country Joe's protest song about Vietnam, which most people knew who had seen the Woodstock ....... as usual, our revised SWA version . Rodriguez's songs were requested, particularly I Wonder, and I was relieved to see that Gary could play it because I had never liked it enough to learn it. Neither of us could play Led Zeppelin's Stairway to Heaven, though Gary managed a few tantalising notes from the intro. I mean, think about it. Eventually we aired a few of our own songs. Held them up like unfashionable underwear. It was difficult to play them with the same conviction that we projected into the songs that had had air time, and that the others knew - the songs that had taught us to sing. While Gary was playing his song, I could see the OC and some of his acolytes peering over in our direction. Like us, they were mere chattels of the military at that moment, and were forced to bed down in the dust with the rest of us. The only difference was that they were standing outside the music.